We Remember the Jews of Gombin! Founder, organizer and president for many years of the New Jersey and the New York Gombin Societies. Jack Zicklin in his forward to Gombin Yizkor Book: "The work of preparing the publishing of the book was done by many of our landsleit, but it is impossible not to give special mention to our dear Sam our former President. Sam was most active and enthusiastic about this project. He was devoted heart and soul to the idea of the Gombiner Memorial Book as he was previously devoted to helping our needy brethren in a Gombin alive with the vitality of a living Jewish community. Unfortunately, he did not live to see the appearance of this book, but we want it to be known that it contains much of his effort, loyalty and warm devotion. With the publication of this Memorial Book we pay a debt to his shining memory." Every Person Has a Name! A Whole Universe is Behind Each Name! A Video with time counter, regular speed 13m, slow version 30m, produced and distributed by the Gombin Society. Unique scenes captured in film by Sam Rafel in Gombin, two years before the German invasion of Poland. Sam Rafel was the most devoted activist of the Gombiner organizations in America. He led the effort to provide relief in Gombin and, after the Holocaust, he helped the resettlement of survivors and the establishment of a Gombiner House in Israel. On a trip to his hometown in 1937, Sam Rafel, then president of the Gombin Society in New Jersey, shot several minutes of 18mm silent footage of the Jews of Gombin. The Gombin Society recovered this footage and had it digitally restored by October Films. These remastered images are a haunting document of Jewish life in Gombin shortly before the Holocaust. President Gombiner Society Detroit, Mich.
Sam Rafel is a well-known name and is synonymous with the activities of the Gombiner Societies in New York and Newark. His de­voted spirit for various undertakings have influenced the work of these organizations as far back as forty years ago. He encouraged our activists even in Detroit whenever measures needed to be taken to ascertain a successful monetary campaign. He brought his dynamic and loyal energy to fruition during the building of the Gombiner House in Israel, to assure a fund for aid to the needy; and to immortalize the names of our martyrs in our own home in Israel. I recall the year 1941, when we, residents of Detroit recom­mended a project to raise the sum of 25,000 dollars - we called it the "post war fund" - and we called all Gombiner Societies to take action immediately, without delay. Then, during the dark night, during the fearful period, under the shadow of war, we thought the war would soon end (we did not think otherwise) and with the war's termi­nation, the world would live in peace and freedom once more including our town Gombin. Our help must be ready in advance, waiting for the oncoming liberation. Who else, if not us, landsleit, will accommodate and meet the great need that we anticipated for the rebuilding of war-torn Gombin? Who would have im­agined at that time that the devas­tation would be so total, so colossal, and so brutal, that not one living soul would remain alive? At that time, during the projection of our plans for raising this huge fund, we did not have to hold forth with Sam Rafel, with the delegate from New­ark and the Newark Societies, about our important task. I have before me a letter dated November 1941, from which I quote: "You have a grand project and I am with you wholeheartedly. I shall do everything possible to bring this undertaking to its successful conclusion. We are cal­ling a meeting immediately!" Since then, even more than previously, the personality of Sam Rafel has revealed itself to me. I quote from the letter which followed the first: "I am happy to inform you that I have a great deal of sup­port and backing for the fund -and I opine that the sum to be raised should be increased to $35,000. It is a grandiose project and must not remain in the stage of a dream." The personality of Sam Rafel has revealed itself to me not exclusively in money matters, not only in the realm of material aid and activities in the realm of fund-raising - but, mainly for his individual idealism and heartily warm attitude and de­votion to "Gombiner activities" - that were near and dear to him for many, many years. His profound dedication was equal to Hassidic rapture and ecstasy. He did not seem to know the meaning of defeat. His deep conviction and belief, his urge to help all undertakings, to help other Gombiner activities, were part and parcel of his daily life. His life's purpose became the rendering of help to our "brother's house" in Israel through the benev­olence fund. Afterward he added to his life-long dream the realization of the Memorial Book in Honor of the Gombin Community. This is a mon­umental work depicting and reflect­ing the rise, the growth, the spiritual up swerve, the struggles, the con­flicts, the pain and woe, the devas­tation, the destruction and catastrophe that later befell our home town. He was, until his last breath the leader and symbol of efficiency for this idea. I had the rare honor and privilege of working with my best friend for over a quarter of a century in behalf of Gombiner activities and never failed to derive inspiration from his optimism and his exaltation and ardor. I also want to state that he and also his sympathetic, dynamic and charming wife, Yetta, have throughout their lives shown a devoted attitude to everything, pertaining to Gombin­er undertaking. They were both fortunate in having the opportunity to visit Israel several times and to breathe the air of salvation and deliverance. He was destined to reap the joy of seeing his great dream become a reality, to see the turbulent Israel with its intensive life as the creator of energy. There, in Israel, he met with his 'townsfolk of the Gombiner house within the clear white radiant walls that symbolize all that is new and bright and illustrious. All these impressions he brought with him upon his return home and when he made his reports at meet­ings he spoke of them as if they were a rare wine to be sipped and enjoyed slowly. He was always in a jubilant and festive mood; he was a man of the people, our unforgettable Sam Rafel. Sam Rafel wrote this article specially for the "Pinkus" a short time before his untimely death. I left Gombin in 1913 and went to America. I was seventeen years old at the time, starting out for a strange world. In New York, I had one uncle, my mother's bro­ther-in-law, on whom I could not depend for very much. But I was determined to leave home anyway, conditions in Gombin being unbearable. After the brief revival that oc­curred during the time of the 1905 revolution, when somnolent Gombin suddenly opened its doors to worldly ideas and notions, the Czarist counter­revolution followed with its repressions, terror and police harassment. A mood of resignation set in. The flower of Gombin youth disappeared from town - some sent away to Si­beria, others going to America. An oppressive silence settled over the town. The fresh breeze of ideas that briefly penetrated the town and of restlessness. What was transpiring awakened it, left behind a feeling in Gombin and in other towns and cities of the vast Russian empire was re-enacted in a smaller scale in our house. My only brother, Chaim, who during the brief revolutionary flare-up joined the Socialist-Zionists movement was arrested by the police and kept in a Warsaw prison. My father had a small tailoring business of ready-made clothes. In our household, which consisted of my parents and three sisters, beside my­self, there prevailed a mood of disillusionment and emptiness. I was seventeen at the time. The depressing atmosphere of the town was choking the breath out of me. I finally convinced my father to let me go away, promising that after a brief absence I would return to Gombin. My father, Pinhas Shacher, understood my mood of restlessness. An active person himself, involved in communal affairs, he spent a great deal of time working to improve the lot of his fellow men. He was the trustee of the Sick Society and our house was always the place where Gombin paupers and others who fell upon evil ways would come for aid. Even as a child, I helped my father on many an occasion writing slips to doctors and apothecaries on behalf of the poor, who needed me­dical attention. At the time I was not well myself, troubled by difficul­ties with my lungs. Nevertheless, my father did not place any obstacles in my path and I left by ship for New York. It was a time when visas were not required. It was enough to show on arrival in New York that you possessed twenty-five dollars. Disembarking, I went directly to my uncle's. I had learned a little tailoring in Gombin, but unfortunately during the time of my arrival work was not readily available. I went from one Jewish neighborhood to the next, knocking on doors of small Jewish tailor shops, but none of them hired me. In the end, I entered a store that specialized in women's wear, on Houston Street, somewhere, and told the owner I was a green­horn who had disembarked not long ago, looking for a job. The storeowner looked me over and said: "All right, I'll give you a job." During the two-week period I worked for him, the owner did not pay me even once, putting me off, promising to pay me "later." One Friday he said: "I'll pay you next Monday." However, when next Mon­day I arrived, the man was gone, as were the machines and dresses. He had disappeared as though into the thin air. Subsequently, I found work in a small trouser factory. Later, I worked in a larger one. But I did not re­main long in any of the places, the owners complaining about the quality of my work. I was employed in one little shop, consisting of the owner, his wife, a presser and myself. The owner and his wife argued endlessly. One day they fired the presser and I, in a gesture of solidarity, left too, The presser, a young man with a wife and child, and I went into a "business" of our own. But it did not work out well; we did not receive any orders. I was forced to go back to the shops, but did not work long in any of them, finding it difficult to adjust myself to American ways. For instance, in one factory I sewed a couple of dozens sleeves which were found unacceptable and shipped back to the shop by the store. The boss took one look at the returned merchandize and fired me. Notwithstanding all this, I was able to save one hundred and eighty dollars within the period of a year. I meant to use the money to go back to Gombin. My money was kept in Adolph Mandel's small bank. One day my little bank and scores of others - went bankrupt, taking along all my "capital." There was no ques­tion now of going back. Then the First World War broke out and the thought of returning had to be put aside altogether. It was during this period that I moved from New York to Newark, where several Gombiner landsleit, among them Hymie Rubin and Abraham Shtiglitz, lived in Newark, I work­ed at various jobs and in 1916 became recording secretary of the executive board of the International Ladies Garment Workers Union. My material difficulties seemed to end and I ceased being a greenhorn. I met my wife who had come from Gombin to America with her family when she was still a child, in 1910. With my financial difficulties a thing of the past, I began giving much thought to Gombin and the poverty that reigned in our little native town. Something must be done, I felt, for the needy Gombin Jews. At the time, there began among the Jews from Gombin who lived in New York and Newark a movement to establish some sort of a systematic aid to Jewish philanthropic institutions in Gombin, to establish contact with Beth Lechem, Linas Hatzedek and other such organizations. Thus, in 1920, there came into being the Gombin Relief Committee, drawing its membership from Gom­bin Jews residing in New York and Newark. Among the activists in the organization were Max Jacklin, the whole Kraut family (the father Si­mon and the sons, Alex and Phillip), Louis Green, Max Green, Ralph Ra­fel, Louis Koch, Abe Carmel, Abraham Itshe Zychlinski, Abraham Max, Nathan Kleinet, Maitshik, Wolf Kesselman, Jack Sherman and Joseph Stern. Five years later, after the arrival in the United States of Hersh Karo, there came into being the "Young Men's Benevolent Association." The aim was to provide help for Gombiner Jews who migrated to America. The relief committee too was very active. One of the clauses in the constitution was that aid must be provided to Gombin Jews no matter where they were found. I was, during that period, chair­man of the relief committee. Our work consisted of raising money. We founded the Gombiner Lending Society and most of the Jews of the town, the whole middle class, made full use of it. We were aided in our work by the Joint Distribution Co­mmittee, matching every contribu­tion we made by an equal amount of its own. During the Thirties, there came into being Gombin committees in Chicago and Detroit. In 1930, I went on a visit to Gombin. It is difficult for me to describe with what joy and antici­pation I returned to my native town after being away seventeen years. I looked forward eagerly to be reunited with my parents, my brother and sisters, my relatives, close friends and acquaintances. I did not go empty-handed. I carried with me a sizable amount of money raised by the relief committee, earmarked for the Lending Society and other Jewish institutions in Gombin. On arriving in Gombin - in addition to the joyous reunion at home, I was given a tumultuous re­ception by the Lending Society. The banquet, tendered in my honor, was chaired by Itzhok Shikorski; the secretaries were: Mayer Zeideman and Abraham Tiber. The great honor bestowed on me was, it goes without saying, a tribute not to me alone, the president of the relief com­mittee, but to all the Gombin lands­leit who actively participated in Ame­rican relief work. Representatives of all Jewish organizations and shades of political opinion were present at this banquet. There was a very mo­ving ceremony during which I was given a golden plaque with the in­scription: "To our honorary presi­dent - with acknowledgement for his help." Hatsadek, and the Children's Home, as well. I was very enthusiastic by the manner in which the work was being carried out in Gombin. On my re­turn to the United States, I tried to communicate my enthusiasm to the active members of the relief committee. Seven years later, in 1937, I went again on a visit to Gombin. This time I went with my wife. As on my first trip, I did not go emp­ty-handed. The reception tendered me was even bigger than on my first visit. The affair took place in the Firemen's Hall, in the presence of three thousand people, virtually the whole Jewish population of Gombin. Gombin, during that period suffer­ed of a grinding poverty and of anti-Semitism, the latter inspired by the Polish government. I made a film of what I saw and later showed it on many occasions in America and in Israel. This film, I believe, has both historical and cultural value. As on my first visit, this time too I spent a good deal of my time at meetings whose purpose was to evolve plans to strengthen our relief work in America. Before our departure, I made an agreement with the Gombin Dr. Dzewciepolski that he minister free of charge to poor and sick Jews of the town and send us the bill. All this transpired in 1937, when none of us even remotely suspected that in two years Gombin and the other little towns and villages of Poland would be swallowed by the flames of a cruel war. With the outbreak of the war, our contact with Gombin was severed. It was my feeling, at the time, in spite of what happened, to continue our work, gather money and hold it in readiness to aid all the people of Gombin as soon the war ended. Without too much difficulty, our organizations raised twenty five thousand dollars. Unfortunately, with the war's end came the dreadful news of the holocaust. During those dark and terrible days we received occasional letters from Gombiner Jews who miraculously escaped with their lives. We immediately sprang into action, sending money, clothes and medicine. We initiated a movement to bring to the United States Gombin survivors. In a short time, we obtained papers that enabled fifty families from Polish and German camps to migrate to America. Moreover, we decided to initiate a movement to help Gombiner Jews who went to Israel. Our first move was to organize a Lending Society in that country. At our committee meeting, sug­gestions were made with greater frequency that our destroyed native town should be honored with a monument. As a result, the decision was made to build a house in Tel Aviv, which would be a center for Gombiner Jews and contain under its roof town mementoes as well as a Memorial Hall. After several attempts, we succeeded in obtaining a piece of land from Keren-Kayemet and built a structure with a splendid hall, capable of accommodating 150 persons. On one of the walls are inscrib­ed the names of Gombiner martyrs, illuminated by an Eternal Light and covered by a curtain. Every year there takes place in the hall a me­morial assembly in honor of the marty­red Gombiner Jews. At the entrance to the main hall, are inscribed the names of Gombiner relief organizations in the United States, the men's and women's divisions as well as the names of the officers. The Gombiner House contains a three-room dwelling for the care­taker and his family. We took in a Gombiner couple, named Segal, and their three adopted children whom they found on the way to Russia. As I write these lines, two of the children are married. In 1959, accompanied by my wife, I went to Israel, where the Gombiner committee met us at the airport. 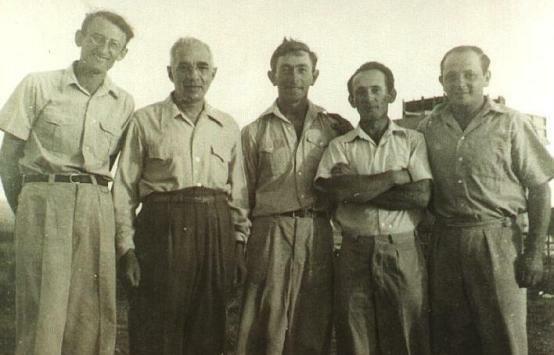 There took place a Yizkor evening at the Gombiner House, which was attended by virtually all the Gombiner Jews of Israel who came from the most distant Kibbutzim and settlements for the affair. As part of the memorial meeting, I showed the film, made twenty-two years ago. I will never forget the heart-breaking sobs that filled the hall when there appeared on the screen familiar faces, relatives and friends. On this journey too, I did not come empty handed, bringing along money earmarked for this purpose by our relief committee. I spent many hours at meetings where we hammered out plans for future work. In 1962, my wife and I went back to Israel. At the splendid reception, the Gombiner Jews of Israel expressed their warm gratitude for our activities on their behalf in the United States. As on our previous visit, the memorial meeting that took place at the Gombiner House was an imposing and moving one. At the present time, our organiza­tions in New York and Newark are very active. We have succeeded in uniting Gombiner Jews from the world over. Through our efforts, there exists between the Jews of Gombin a feeling of warm solidarity and brother­hood. Virtually every affair given by a Gombiner Jew, includes in addition to his family the landsleit who live in that community. Our most urgent task at the pre­sent time is to publish the Gombiner Memorial Book. This task is a sacred one and is on the conscience of each and every one of us. 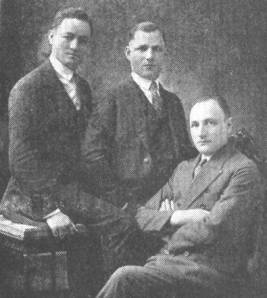 Etinger and Zalman Ben Itzhak (Borensztejn). My letter in Hebrew to Yad Va'shem, The Fighters and Shoah Museum - Beit Lochamei Ha'getaot and the Diaspora Museum - Beit Ha'tefusoth, on 29.5.98, submitting the film made by Sam Rafel in Gombin in 1937, now a VCR video cassette, made and distributed by the Gombin Society. I am very pleased to inform you that the film of Sam Rafel from 1937 was chosen to be in the permanent exhibition of Yad Vashem in their new Holocaust museum! 7-6 years Yad Vashem is working on the new museum. It is supposed to be opened September 2004. Last week I got a phone call from the film and photo curator of the Museum, Nina Springer Aharoni who informed me they urgently need a better version of the Sam Rafel film. I went specially to Jerusalem to meet her and gave her the one copy I got from Jeremy Freedman, I Guess the one sold to the Imperial War Museum in London. During our meeting, Mrs. Springer requested a copy of the film in the BETACUM format. Can anyone provide that please? I shall give you the exact address to send it to. The film will be shown in the entrance to the museum where a CINEMATOGRAPHIC FRESCO will stand. About more than a year they worked only on the idea of the Fresco and choosing the artist which will materialize this idea. In the end the famous Israeli artist Michal Rovner was chosen. The Gombin film will be incorporated into this Fresco. It will be a commemoration for generations! I also was notified of Bernard Guyer's grandfather: Manele Ryzman who was identified by daughter, Chana Guyer - see photograph no. 418. We remember the most moving story about Ryzman's grandson, Pinchas Chaja (1930-1938)'s tombstone, recovered from a pavement in Gombin and erected to Gombin's cemetery together with other 100 matzevot in August 1999.
Who Are the Jewish Townspeople of Gombin in the Photographs? 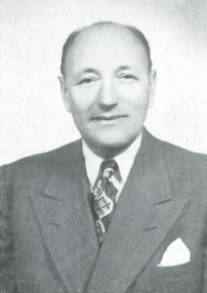 I wish to thank the descendants of Sam Rafel z"l who gave the film made by their father in 1937, to the Gombin Society. My work is dedicated to Sam Rafel's blessed memory. Recently I converted the images to JPG format and added a number to each of the images, which are displayed in the following web pages. Out of 420 images captured by me in the past, remained 258, which could be processed and posted. I've sent one CD to Noam Lupo from the Gombin Society to show these images in the Gombin Society Web Site and make an album to be sent to Ben Guyer, Rose Greenbaum-Dinerman and other Gombiner survivors. I hope with all my heart that some of the people filmed in this film will be identified and their names be recorded forever.